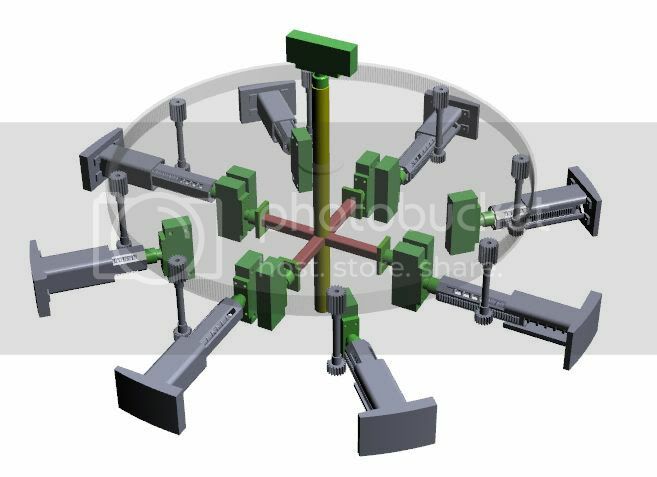 The green boxes in the picture are clamps holding rare earth magnets (I preferred to use rectangle magnets 1 length by 3/4 height by 3/4 width. The premise of the engine is the magnet attached to the grey colored part is held in place forcing the magnet on the arm attached to the middle bar in yellow to turn. the middle bar is connected to a large gear (the translucent circle on top) which is then connected to a smaller gear. this smaller gear is connected via a bar to another gear of the same size. This gear then connects to a rack with gear teeth that is part of the side of a piece that is interconnected to a part that has a spring built inside. The small gear connected to the rack will have missing teeth. This will allow one magnet to be held up and in place while allowing the next magnet in the next grey colored piece to go down and out of the way as the magnet on the arm is pushed forward and pass it. Once the clamp is pass the second clamp on the grey piece, the space on the small gear will allow the second clamp to pop up in position behind it. The magnet I used weigh .25 oz. At 3/4 an inch away from each other, the magnets were applying 2 1/8oz pressure. At a distance of 1 inch, they were only applying 1 oz of pressure. When the magnet is not aligned with the other magnet, then pressure at 3/4 inch applied to the second magnet dropped to 1.75 oz pressure. 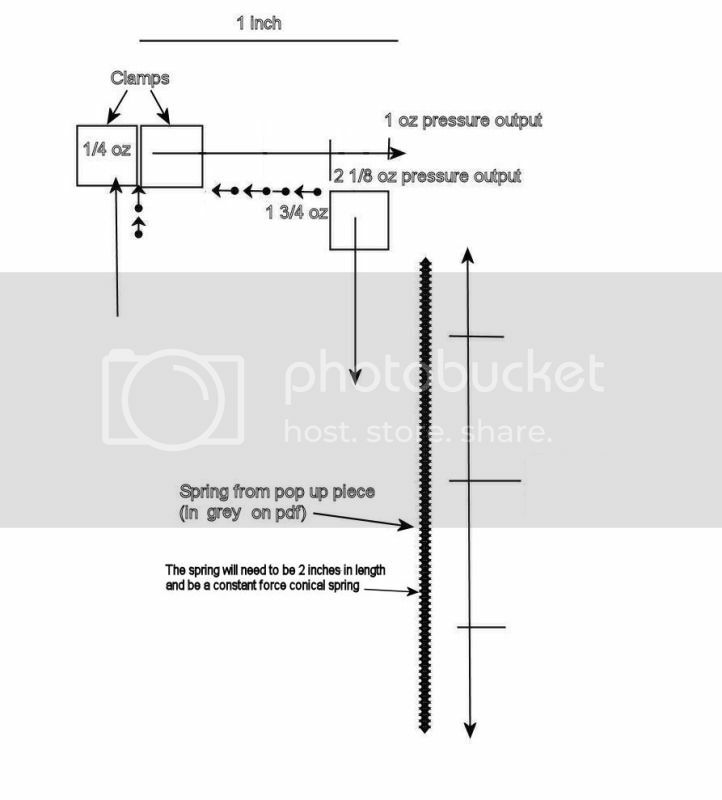 The spring will have to be strong enough to lift the .25 oz magnet while fighting against the combine effort of the magnet and friction of the device. Bare in mind the pressure is lessened due to the fact that the magnet is not in-line with the other magnet as it rises up. Also forgot to note, if you hadn't already figured it out, the magnets would be positioned on the clamps with the longer side exposed to each other and not the poles. Forgot to ask, if anyone does in fact try and put this thing together, think you could post it here? Thanks.